Western Digital, a company who is better known for its enduring legacy in storage solutions, announced that it will be dipping its toes into the consumer wireless network market. The company unveiled four new home router products that will cover most bases for consumers, starting with the no-frills N600 and finishing with the N900 Central -- a router that is effectively a NAS with up to 2TB of included storage. 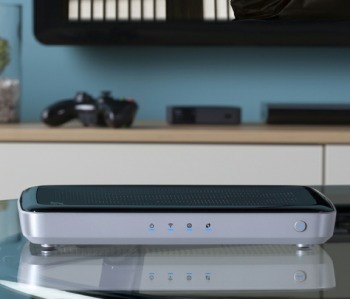 Probably emboldened by its past dabbling with TV boxes, MyBook Live and its own line of powerline AV products, wireless routers seem to be a logical step for WD. However, it is safe to say WD's entry into the consumer networking space marks an uphill battle for the company. There are already a number of well-established players out there like Netgear, Linksys (i.e. Cisco), D-link and others. In order to set itself apart from existing offerings, Western Digital calls its new products "My Net Entertainment Accelerators". Doesn't exactly roll off the tongue, does it? Truthfully though, this gimmicky marketing phrase is WD's way of advertising its "advanced" QoS (quality of service) and FasTrack features, selling points which the company is trying to play up as major benefits. WD's take on QoS automatically detects and prioritizes certain types of traffic, like streaming video from Hulu. Theoretically, this should help provide an interruption-free Netflix experience, for example, while that Windows 8 Release Preview ISO continues to download or while your laptop is performing a Wi-Fi backup to your NAS. FasTrack offers users 21 available slots for QoS customization while FasTrack Plus offers an unlimited number and real-time traffic analysis. FasTrack Plus is only offered on the N900.